A participant in this year's International Forum London-based artist Ira Brand gives an insight into her experiences at the Theatertreffen 2017 and learnings about the German theatre scene. I left Berlin on an early morning flight, exhausted, buzzing, and a bit sun-kissed. I had spent sixteen days as part of a cohort of thirty-eight theatre artists, practitioners, and scholars from all over the world, brought together by the embrace of the International Forum that runs alongside the Berliner Theatertreffen in May. When I landed it was surprisingly cold in Berlin, and as I left it was hot and there was glorious sunshine, as if my time here had been not two weeks but two months. And it felt in other ways longer, the experience so rich that it had been almost impossible for me to reflect on it ‘live’, as it was happening, beyond the reflections designed to meet our most immediate needs – “what did you think of that show?” and “shall we have another beer?”. As I left I thought about space. I was reminded that I need space around these kinds of encounters, festivals and other moments of cultural gathering, that are always designed to be filling, full, overflowing even. Space around the work I see, the meetings with other artists, the workshops and discussions, to allow for the water to still and for all the things I feel and think and hate and love about them to slowly settle to the bottom and become something more observable. As I write this now I think the water is still somewhat stilling, but things have become more observable, more critical and reflective. My practice is as a writer and performance-maker, and also as a curator with arts-collective Forest Fringe. I make work independently – often solo – with a background in live art as much as conventional theatre. I arrived in Berlin knowing little about the Theatertreffen but expecting to encounter radical independent approaches and forms, work made at the edges of institutionalised theatre. The first few days, then, were a kind of mapping of the terrain, trying to understand what place Theatertreffen occupies in the German theatrical landscape. The Theatertreffen is a festival that presents the ten “most remarkable” theatre works that have been produced in the last season in Germany, Austria, or Switzerland. Productions from these countries are seen and selected by a jury of seven theatre critics. We are told at a discussion with the director of the Berliner Festspiele (the home of the Theatertreffen), Thomas Oberender, and one of the critic-judges, Eva Behrendt, that the jury rarely – if ever – agree unanimously on the inclusion of any of the works. We, the International Forum, are also largely divided. Most of the ten pieces are made by and within big state theatres. For me, coming from the independent scene in the UK, I see big budgets, large casts, impressive sets, work created on main stages, and with major institutional support. I say this not to dismiss the shows, but just to acknowledge the recalibration I go through in those first days, understanding what the Theatertreffen does and stands for. It is a prestigious festival that I cannot help but perceive as ‘mainstream’. I enjoy imagining what the ten most remarkable German-speaking productions might be if they were selected from works made in people’s basements and kitchens, for example, or if they were selected by artists, not critics. But what fascinates me is that ‘mainstream’ in Germany still looks far more radical than the same in the UK. The pieces I saw felt resonant with my own practices in a way that the things I see at the National Theatre in London never do. I also don’t mean to romanticise the work, there was much of it I found flawed or problematic, but I felt there was frequently a base level of attempt and risk at play in it. The Borderline Procession, for example, by Kay Voges, Dirk Baumann and Alexander Kerlin is somewhere between an installation inhabited by performers and live film-making: an impressive cinematic set with the audience sat on two sides circled endlessly by a live-video-feed camera, its images projected on screens on top of and alongside the live action. Additionally music, audio, and texts are interjected, layered, offered to us, an improvised, live and collaborative act of composition each night. While The Borderline Procession intends to engage with the overwhelming simultaneity of material, with the impossibility of seeing everything, my experience was actually one of feeling my gaze very directed by the power of the camera. But the creation of the work within an improvisational and collaborative structure seems to engage with the modes of production – arguably championing less hierarchical, less product-driven ways of making – in a way that I think is rare in work of this scale in the UK. Other pieces also drew on bold aesthetics, mixed forms, invited non-linear, non-narrative viewings. It was thrilling to see work made with expansive casts and high production values, institutionalised and well-supported theatre, employing the experimental approaches and languages that in the UK are more often found in marginal spaces and practices. I thought about what it means, really, to operate as an artist in a theatre ecology where the works that symbolise success or sustainability largely don’t speak to or inspire you. It was exciting to witness this work here, not at the periphery. The support structures and systems for art making in Germany and the UK are so different, and I am only just scratching the surface of understanding how, and what this difference enables. The German ensemble system, in which each theatre has a full-time ensemble cast who visiting directors work with, clearly cultivates strong collaborations but is also not without its problems. There seemed to be a pretty shocking lack of diversity in the casts I saw, for example: very predominantly white and entirely able-bodied, as far as I recall. I assume this is in part a consequence of the ensemble system in which the bodies represented on stage are defined by those permanently engaged by the theatre, and a wider system in which the question of who has access to becoming part of an ensemble, or working in the industry at all, is not being asked with enough rigour. Of the ten Theatertreffen shows there was only one by a female director, and none directed by a person of colour. And yet this year’s show Pfusch by Herbert Fritsch is his seventh production at the Theatertreffen. The argument, of course, goes that the works represented are chosen only on the basis of being “the most remarkable” but it feels weak, pointing to a conversation around access, diversity, support and exclusion that is not happening early enough, not deep enough at a systemic level. In this respect I thought the same conversations that I see happening in the UK – while by no means complete – feel far advanced. There were wonderful moments also of dipping out of the mainstream of the Berliner Festspiele to see work at other arts spaces, expanding the process of mapping a city’s cultural terrain. We saw Meg Stuart at HAU, and I took myself to see She She Pop, whose work I’ve only seen once in the UK but once was enough to fall helplessly in love. In addition, the International Forum scholars participated in workshops led by visiting artists. My workshop – facilitated by Danish choreography duo Two-Women-Machine-Show, performer Jonathan Bonnici and musician Santi Rieser – was the perfect compliment to much of the other activity which was about observing, thinking, discussing. We worked very physically every day, opening up other modes of experience and observation that were embodied rather than cerebral. I loved that we were invited into a process of exploring with the artists, as opposed to being ‘taught’ by them, and this fostered a sense of equality and a strong group dynamic that I really valued. As somebody whose practice includes festival curation I thought a lot throughout the workshop, and my time at the Forum generally, about a festival as a way of building a community, a festival as an event, and all the things outside the ‘festival proper’ of the programmed shows – the workshops, and the beers, and the trip to the lake where thirty-eight people swam and lay in the sun together – that allow a community to form. The heart of my time in Berlin was the meetings with the other Forum artists, which felt so vital and joyous and radical at a time when so much of the political landscape aims instead for separation and division. All these people were so different and the gathering felt more joyous for this difference, not less. Between the thirty-eight of us we barely agreed on anything. And it was great. And sure, we were all artists, so it’s probably fair to assume some similarities in our ideologies, and sure, the thing we were disagreeing on was theatre, mostly, not geopolitics. But of course when we talk about theatre we are also talking about politics. We are talking about economies, and geographies, and histories, and social systems, and cultures, and representation. We are talking about what we choose to make work about and why, and how the work is made and why, and what kind of work it is even possible to make, and who gets to make it, and why. And also, I believe in small gestures and the local. In small, personal, everyday actions and inter-actions as the building blocks of bigger change. As the water stills further, these meetings are settling too and beginning to transform, at the very bottom, which we know is where the really juicy stuff happens, from ‘meetings’ into something else as yet undefined. When I left Berlin I thought of these two-and-a-bit weeks as a bit of a bubble, with the implication of the experience being somehow removed from the ‘real world’. But now I look back and think of them actually as more of a microcosm, a miniature model maybe, a potentiality. © Ira Brand Ira Brand is a London-based artist, performance-maker, writer, curator, and teacher, originally from Germany. She creates live interdisciplinary performances inspired by the questions and phenomena that she considers central to the experience of being human. Her process is one of using personal starting points to speak to wider social, political, and formal concerns. Her work incorporates text, video, interviews, and research process, and she increasingly works with choreographic practices, exploring a physical language of the ‘untrained’ body. Her work has toured the UK extensively and has also been shown internationally at Malavoadora Porto, Matadero Madrid, Kanagawa Arts Theatre Yokohama, Hessisches Landestheater Marburg, and Abrons Arts Centre New York. 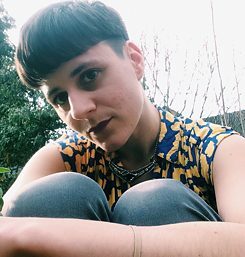 Ira is one of the co-directors of award-winning artist collective Forest Fringe, with whom she has delivered projects as an artist and curator in Edinburgh, London, Hong Kong, New York, Dublin, Lisbon and Kanazawa, Japan.